But it's been a good time that helped me to think back and define some basic mistakes that beginning freelance translators often make. This post is about mistakes in business. I kind of assumed that everybody knows already about proofreading their work, etc. ;-) I tried to come up with some advice about each point in the list. Let me know what you think about the list, what you can add there and what advice you would give to new freelancers if you already have some experience in freelance translation. 5. Inability to say "no". 1. When setting your rates, make sure they are adequate to your experience. Charging too little money may say to your clients that you are not professional enough, and may even attract some scammers. You can read more about scammers and their schemes of work in my post "How do we make sure we get paid for our work?" It was written in 2010 and has been pretty popular since then. Charging too much and failure to provide the level of quality associated with the price means that you will lose clients and eventually lose your credibility. I think it makes sense to make your own little investigation and find out how much other translators charge, especially those who specialize in the same language pairs, fields and have a similar level of experience in translation. 2. I think only agencies can specialize in everything because they have lots of different people in their databases. I think the best thing here would be to choose subjects that you love and know much about. Some translators come into freelance business with a second degree in a different field, e.g. in chemistry, law, art etc. Even if you don't, think about your hobbies, find out which topics you know best so you can specialize in them. I have a good friend who is also a freelance translator, and she just loves texts on fishing! I don't know much about it and, to be honest, don't really feel enthusiastic about it. So if I ever get a request to translate a text about fishing with lots of details that only experience fishermen understand, I know who to turn to! :) Of course, the list of specialty fields may change with time (just like our hobbies and areas of our special interest), and that's ok! For example I didn't specialize in marketing texts from the very beginning. That topic appeared a bit later in my life, when I started my own marketing efforts. - Being afraid to ask your customer questions.Do not be concerned with asking your clients questions about the files you are translating: there is nothing wrong with going back to your customer asking for clarification of words that maybe be difficult to read or understand. They will not think any less of you because you asked a question. Be sure, however to ask relevant questions, well in advance of the deadline. - Only getting in touch with your customer when you need work from them.Keep in touch with your customers regularly. Let them know how you are doing. Tell them about the new tools or software you may have acquired, and any new skills you may have learned since last working with them. I would also add another aspect here that especially concerns large projects: it's good to update your customers about the work process from time to time, maybe once a week or so. Thus your client can be sure that the work is being done and that it will be completed on time. My 3rd post in the series "What makes a good freelance translator" has more ideas about communication. 4. Very few freelance translators have an inborn marketing and networking talent. Those are the things that we should always be studying and practising in order to succeed! This is an endless topic for discussion! There are lots of social media sites that can be used both for networking and marketing. Even this blog is a marketing tool. Speaking about networking, there are professional translation conferences that regularly take place in different countries. Here are just a few upcoming proz.com conferences in 2012 as an example! I'd love to take part in a real conference. Maybe this year it will work out. I hope so! But I've taken part in two proz.com virtual conferences which have been a tremendous experience for me. Here you can find the list of proz.com virtual conferences for 2012. I am also thinking about becoming a member of a professional translation association. All associations have their own conferences and powwows. Plus it's good to communicate with other translators in your home city/country, maybe meet at a cafe over a cup of coffee like Russian translators in Ekaterinburg do. I know a few translators in my city and we occasionally write to one another, or see one another, though we don't have scheduled meetings (yet). 5. Many freelancers have fear that if they say "no" to a particular project they won't hear from this client again. Back in 2010 I read a very good post in a great blog called "Brave New Words". The post is called "Saying no now - and forever?" If you have the same fear, please read that post! Sometimes we do have to say "no" to a customer for good. For example, I had to say "good-bye" to a client just a couple weeks ago. I feared that step, though it was absolutely necessary. Thank God, everything went well. I recommended a couple colleagues to this client, they found another translator, and we parted with no hard feelings. That's a normal part of a freelancer's life. Yes, that may mean moving out of your comfort zone, but it's a normal part of life. 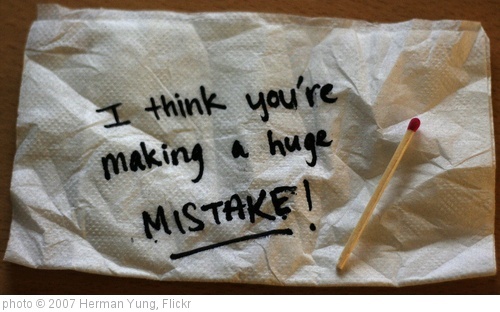 If you are a beginning translator, I hope this post helps you avoid these 5 business mistakes. If you are an experienced freelancer, what other business mistakes can you name and what advice you would give to new freelance translators? The second mistake you say is so true. It's not an advantage. In our company the projectmanager will choose a translator who is specialized in a specific subject. If you have too many different subjects...it is not trustworthy.